I’ve seen this pop up in a few places, and figured it might interest some of you. DriveThruRPG is offering a package of PDF downloads for various RPGs as a way to generate funds for Haitians dealing with the aftermath of a devastating earthquake. If you’re a cold hearted capitalist, this is a fantastic deal to get some good source material for tabletop RPG play. Take advantage of the situation, you big meanie. So, for $20 you can champion your cause, whether it’s selfish capitalization of tumultuous times, or trying to help people when all you have is a checkbook. Who said gamers only want to kill things? Kingdom Hearts 358/2 Days is a great little game. Disgaea DS has also been a blast. I’ve clocked 45 or so hours in the former, and 200 or so in the latter. The “main story” of the former took about 30 hours to go through (chasing all side quests), and the “main story” of the latter took about 20 hours (doing some side dungeoneering). I find I keep playing both well past the story’s end, albeit for different reasons. The core gameplay of KH:358/2 is all about missions. These are bite-sized chunks of the standard KH gameplay, an action-platformer-RPG… thing. Missions range from recon to target hunting to simple baddie smashing (complete with small baddies, medium-sized baddies and Big Bad Boss baddies). None of it is too taxing, but several missions require good timing, quick reflexes and/or knowledge of the terrain. The core gameplay of Disgaea DS is all about tactical turn-based combat in closed square-grid arenas. Players build up a cast of characters and field combat teams to take down a range of weird enemies. Cutscenes tell a story between fights. The ability to revisit missions and an optional Item World dungeon system provides combat on demand to earn more experience, money and items. None of the tactics are all that demanding, but there are several that provide a more puzzle-like experience, rather than a simple tactical brawl. The “post-game” is fairly different between the two. In Disgaea, I’m playing through the storyline again (yay for “New Game +” mechanics!) to see a different ending, but I spend most of my time in the Item World. Item World levels are procedurally generated, and often a great playground for the geopanel system. Every level I go to in the Item World is different. The team I have is pretty static by now, but the stage that I’m playing on changes constantly. I’m constantly tinkering with new content thanks to the procedural floor generator. Sure, the ultimate end goal is always the same (defeat all foes or sneak to the exit), but the path through each level is different. The ends are still the same, then, but the means change considerably more than they do in KH. This is the difference between 200 and 45 hours logged. I’ll play each more, I’m sure, but in the end, I spend a lot more time playing through the procedural content in Disgaea DS than I do playing through static content in KH. To be fair, procedural content only works in certain formats. The lovingly crafted beautiful 3D worlds in KH don’t lend themselves well to procedural content generation. The procedural content in Disgaea DS is tile-based, with some larger multitile structures, but certainly nothing as carefully presented as KH worlds. So, if there is a balance between pretty graphics and playability via content generation, I find that I fall squarely in the camp of gameplay. I’m more interested in means than ends, at least when I’m playing games. It’s not too surprising that I feel much the same way about MMOs. To be sure, the content generation there will naturally be more in line with the KH model, being in 3D and requiring more assets. I’m still most interested in varied, dynamic, interesting gameplay, rather than chasing loot through the same dungeons. Raiders have told me that the dynamics of a group can provide some of that, so I can see myself dungeoneering a little while learning a dungeon, but once it’s on farm status, just going through the motions for better loot or arbitrary Achievements does nothing for me. No, I want a living, dynamic world that I can influence and mold. I want to color outside the lines, ignoring the ends. I’d be content tinkering with the means, because once I get to the end, that’s all that you have to keep me in your game. Crayon Physics is currently on sale, using the same sort of “pay what you want” method that World of Goo did a while back for their birthday. It worked out pretty well for the WoG guys. Here’s hoping it works for Crayon Physics. The sale ends Friday the 15th of January, though, so if you want this excellent game, get over there and buy it! My wife liked it. She really liked the 3D aspect; it reminded her of the fun of experiencing 3D movies as a kid in Disneyland. She’d like to visit Pandora, albeit via an Avatar, perhaps, for safety’s sake. tvtropes has plenty to say about it. I consider it to be Art, but don’t think highly of it as a film. I still like it. Let me expand on 3 a little. I really like what they did with the visuals of the movie. The 3D was good when it wasn’t broken, since it was more atmospheric and spatial than a mere gimmick. The art direction is solid, with consistent visual appeal. The world is lush and interesting. The characters are actually my favorite part, because they feel plausible. The animation and characterization is excellent; they don’t feel animated, they feel alive. Compare the characters to those in the Final Fantasy: the Spirits Within movie. 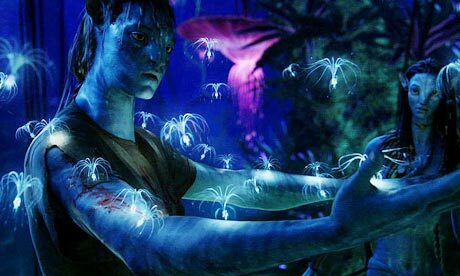 The difference in static appearance isn’t much (stills from either film read pretty well compared to each other), but the Avatar characters move more plausibly, complete with imbalances, personality and body language. I’m not sure whether this is a leap in motion capture or animation technique and technology (or just more money thrown at an issue), but there is a marked difference between Jake Sully’s Big Blue and Aki Ross. Dodging the Uncanny Valley by using not-quite-human characters also probably helped significantly. Either way, this is why I tend to stress that animation itself is more important to selling the sense of life than high resolution textures and 3D glasses. The Disney animators tend to believe similarly. Pandora, the movie’s fictional world out thataway somewhere in Plot Space, looks like it could be a real place. It’s interesting and pretty. The floating mountains are especially awesome in my eyes, though the biophosphorous neon jungle might be more appealing to some. I can only imagine that an IMAX viewing of the show would be rather exhilarating, especially in the flight scenes. So… it’s all very pretty. The story is almost paint-by-the-numbers, though, and it really clashed for me. It’s been compared to Dances With Wolves, albeit with blue body paint and technogeek body swapping (the titular “avatar” technology). I could certainly nitpick a LOT of things in the film, but it’s not really worth it. It’s not a bad story, exactly, but it’s nothing all that spectacular, innovative or interesting. Then again, one might wonder if the market really wants innovation? Similarly, Avatar would have been a great artistic tech demo (Picasso’s early Cubism could be considered a tech demo, and it’s considered Art), or even a fantastic game, sans the caricature story and almost-romance with blue almost-naked almost-people. It’s not a terrible film, and it’s a pretty good “experience”. It looks really good. I guess that’s enough to make money, though. Why do we even care about innovation, again? I mean, there’s got to be something more importan… ooh, sparkly blue thingy!! !